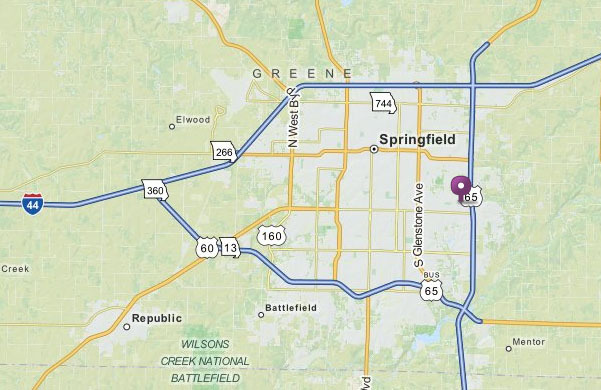 Springfield, Missouri is located in the center of the United States, so it is easy to get here from just about anywhere! You will be here for almost 4 months making the convenience of a car important. However, the Boards Ready Apartments are only 1.5 blocks from the apartments making it an easy 5 minute walk! Springfield has a National Airport, Springfield-Branson Airport (airport code: SGF). American Airlines, Delta and Allegiant fly regularly into Springfield. The airport is a 20 minute drive from the apartments and class. There are always cabs available at the airport for your convenience. Cabs will generally run $30 (plus tip) from the airport to most locations in Springfield. Please inform us when you will be arriving (Plane or Car) so that we can have everything ready for your arrival. Classes located at 3259 E. Sunshine, Suite AA, Springfield, MO 65804. CAR RENTALS: Springfield has numerous car rental agencies if you should decide you would like a car once you arrive. Please do NOT assume that others that do have cars are there for your transportation needs. EVERYONE here at Boards Ready is here to study and prepare for their Step 1, not to serve as a taxi service. SO DO NOT ASK SOMEONE WITH A CAR TO TAKE YOU PLACES!! We have found that most of our students that do drive are very considerate and offer rides to others WHEN THEY ARE GOING (not asked) to the grocery or laundry. Please know that when you accept a ride that we DO expect you to help contribute gas money. The driver should not have to ask you to help contribute. You are coming to study, so you will not need a lot. Bring a small wardrobe: casusal clothes or scrubs for class. Scrubs are also fine for the clinics. If you are in the Boards Ready Student Housing, they are totally furnished. The only things you will need will be personal items: sheets, pillow, blankets, towels, toiletries, hair dryer, robe and slippers to go from your bedroom to the bathroom, prescriptions or OTC medications, computer, chargers or any other personal items you want for the semester. You can get all of that here: we have many stores (inexpensive and expensive) to choose from if you don't want to pack those items. We only use the Boards Ready Book for the class so you will not need to bring any books. We also supply all note taking needs, so you don't need to bring these either. If you will be staying in another facility (a Host House or Apartment or Extended Stay Hotel) you will need to speak with them to see what you will need to bring. But in general it will be the same as you would for the Boards Ready Housing. Many of the Host Homes will provide sheets/blankets/pillows/towels. But you will want to verify this with them. IMPORTANT INFORMATION ABOUT THE STUDENT HOUSING: See "Housing Info and Rules" page for detailed information. All houses are furnished and stocked with your BASIC needs. This means: beds, dressers, lamps, study table, hangers, couch, coffee table, dining room table/chairs, pictures, refrigerator, (the St Charles house does have a washer and dryer), pots and pans, plates, bowls, cups, glasses, silverware, baking sheet, mixing bowls, dish drainer, dishwasher, cutting board, coffee maker, microwave, toaster, electric can opener, cooking utensils, shower curtain, broom/dustpan, sponge mop, matress cover, trash cans, a starter pack of papertowels and toilet paper. The housing is cleaned prior to your arrival. Many times (not always) students will leave items for the next group of students (such as canned foods , cleaning supplies, or other things they have purchased while they are here). NOTE: ANYTHING else that you feel you need or prefer something different than what we have for your housing is STRICTLY your responsibility. Do not expect or ask us to "customize" your housing. Just as with any housing, you will need to purchase what you want for your semester: from cleaning supplies to kitchenware to decor. If YOU cause something to be broken, plumbing backed up because of pouring grease down the drain or flushing things down the toilet, window broken, broken furniture, broken dishes, holes/damage in the walls (nail holes or otherwise): YOU will be responsible for calling for a repairman and responsible for that bill and/or responsible for replacement/repair of the item/s damaged.